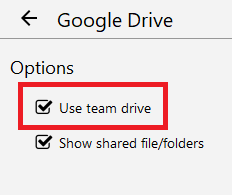 My issue is that I cannot access my teamdrive folders within my gdrive account. It’s the same with Netdrive, I cannot access teamdrive folders from window’s explorer. I can only access general gdrive. Did you try this on sync configuration? I guess this is limitation of google drive. You did upload your files on team drive but you own that file. That may uses quota of your account. Yes, I’ve tried that and it doesn’t work. I can only access files through windows explorer once they’ve been placed via the google drive web browser. Does that make sense? Netdrive won’t let me transfer more than 5gb files through windows explorer because it reads my google drive storage (5gb) rather than my team drive storage (10tb). Please help. Do you want to use NetDrive to access google drive? You posted for CloudSync. So I have to know first what software do you want to use. As I said before, this can not fixed right now. We need some days to determine if it’s possible. I would like to use it for Net Drive. I have a trial of Cloud sync but couldn’t test it properly .